Maxi-Health Research® is proud to provide you with our most advanced dietary supplement, Naturemax Energize™ - Strawberry.. It’s professionally formulated to provide you with all the nutrients you need to stay healthy and fit. 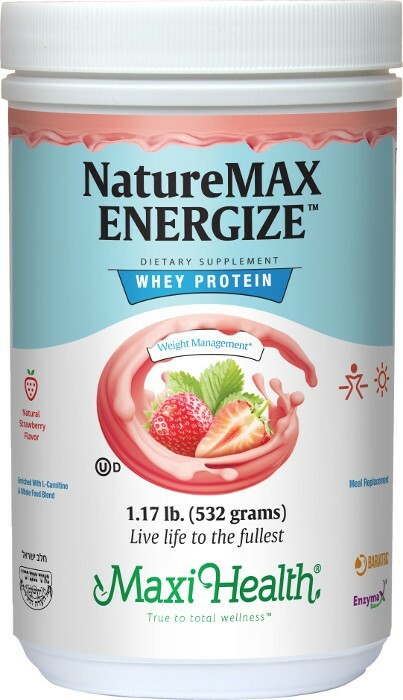 Naturemax Energize™ is a delicious natural strawberry drink enriched with easily digestible whey protein, fibers, enzymes, amino acids, vitamins, essential minerals and powerful antioxidants. * it is also available in three otther natural, delicous flavors, chocolate, orange-vanilla and strawberry. No artiﬁcial ﬂavors, or colorings. TRAACS® LLC. is a registered trademark of Albion Laboratories, Inc.